It published 450 articles...in just 15 days. With dwindling budgets that require big layoffs, you really can’t fault the news industry if it wants to catch a break. And to that end (although this is not so awesome for the news industry’s writers), a lot of media outlets are kind of going full AI. Case in point, The Washington Post threw its hat in the AI game when setting it’s AI, “Heliograf,” to cover the Olympics, writing basic stories and keeping tallies of medal counts. But one news outlet has them beat. 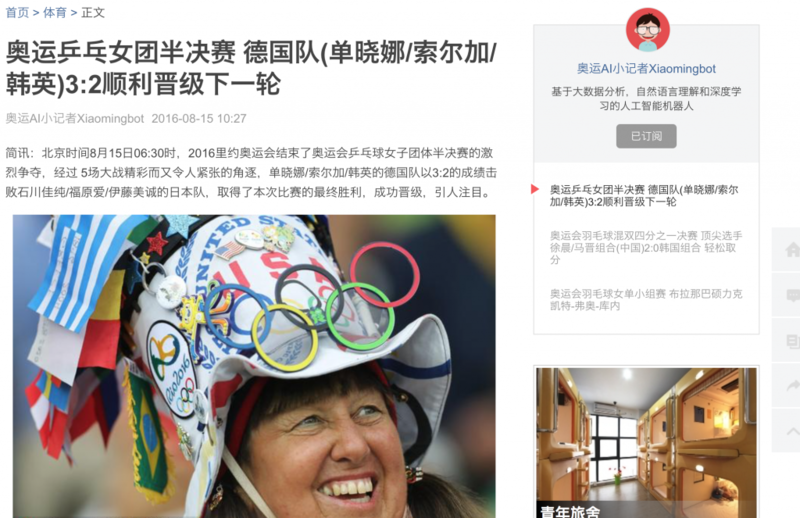 Search engine and news syndication service Toutiao has employed Xiaomingbot, an AI writing robot, to cover the Olympics. Get this: the robot was able to publish 450 articles over the course of the 15-day event. Developed by Peking University and Toutiao, the robot was able to publish 30-40 articles a day. It does this by poring over the Olympics database searching for real-time results. Its articles regularly ran around 100 words, but its longest was 821. Xiaomingbot was designed to be faster than other reporters/AI, able to post an accompanying photo, and have a more natural feel to the writing. It succeeded, at least by most accounts—alas! Not even high tech AI are safe from internet trolls, and there are some issues. As Quartz reports, the AI still has a rather “mechanical” form of writing, needing improvement in some wording. Still, this seems to be a bold and unprecedented new era in writing.